Despite how much we covet celebrity airport style, it's not always so easy to figure out what you should wear on a plan when push comes to shove. Stilettos and high-waisted leather pants look great in paparazzi shots of stars strutting through airport terminals, yet in action, these statement-making ensembles can prove a bit trickier. And though we'd all love to look our best when hitting the skies, certain wardrobe pieces are best left in our checked bag or carry-on. Who better to inform us on what to never wear on a plane—and what to wear instead—than someone who works at 35,000 feet? 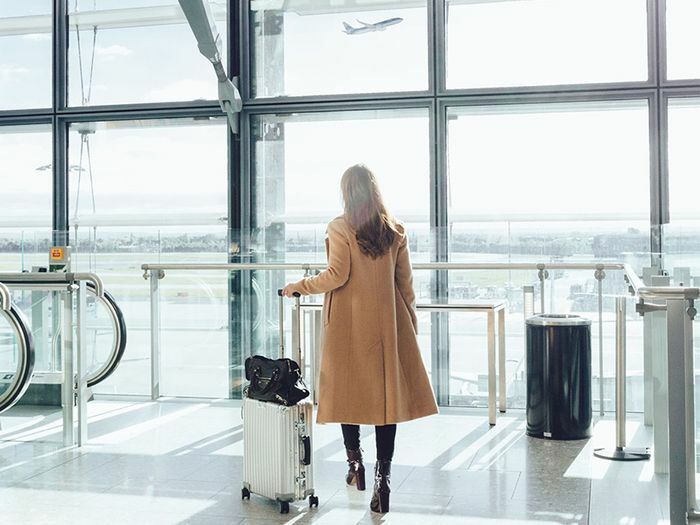 We reached out to American Airlines flight attendant Andrea Fischbach to spill her list of things you shouldn't wear when flying—for the sake of comfort, practicality, and safety—as well as her recommendations for what you should wear instead. Keep scrolling to see what a flight attendant says to never wear on a plane in addition to the pieces you should wear on a plane. "I would advise against anything really constricting," says Fischbach. "You want to get the most comfortable you can be to avoid cramping, swelling, and anything that can affect you later." Allowing for healthy blood circulation is especially important to avoid deep vein thrombosis (DVT), which occurs when a blood clot forms in a vein, usually in the legs. "It's very important to be able to move around a bit in your seat—very difficult, I know—and keep your blood flowing," Fischbach explains. "If you are tall, travel a lot, or are on a long flight, this is extremely important because you face the risk of developing DVT." More innocuously, swelling in the stomach can also occur, causing discomfort—especially if you're in restrictive clothes. "Bloating is a major issue, even for flight attendants, so wear something comfortable around your waist like elastic," suggests Fischbach. "As cute as they may be, leather pants probably aren't the best." While a fire may be one of the last things on your list of concerns when flying, it is something to take into account when dressing for your flight. Fischbach names fringe and flammable materials as hazardous items should there be an emergency. "Going a bit extreme here, but there is always a risk with long fringe should the plane have a fire," she says. "While our uniforms have polyester in them, I always wonder and worry myself that they could be a hazard if they got too close to extreme heat and melt on us." Though Fischbach admits it's a bit morbid (and most likely nothing to worry about), it is a scary reality in the event of an emergency. "I traveled a lot growing up and one rule my mother made me follow that I continue to follow to this day is to always have my body covered," says Fischbach, who opts for long sleeves and pants. "Emergency slides are not fun to go down and hurt—a lot—and it's not a smooth landing once you reach the end of the slide," she explains. "The more you cover the surface of your skin, the more protection for your largest organ." Deciding which shoes to wear when flying can often be the trickiest part of the outfit to nail down, so we asked Fischbach if there's a specific style you should simply avoid when flying. "High heels and backless sandals make it difficult to quickly evacuate the aircraft, and heels can possibly cause further damage to emergency exits or hurt others if they go flying off somehow," she says. "I would really advise against high heels or flip flops or any slides, mostly for safety purposes. If there is an evacuation and slides are required, your high heels will have to come off as they can puncture the slide. Who knows where and in what conditions you'll land, plus they aren't very practical running gate to gate." (She suggests watching out for late flight attendants, and you'll see what she means.) Fischbach notes that even flight attendants change shoes during the flight because it isn't practical to wear heels the entire time. "As if another reason is needed, they make the metal detectors go off (if you are lucky enough to have pre-check) thanks to nails in the heels," she explains. "Flip flops and backless shoes can also end up flying off your feet, and your feet are more likely to freeze, especially during a long flight." Furthermore, open shoes can make for an unsanitary visit to the airplane lavatories. "Be wary of wearing sandals if you are planning on going in the lavatory," warns Fischbach. "That isn't water on the floor (yes, use your imagination), and sandals invite whatever that liquid is to splash on your feet." As Fischbach noted with the nails in high heels, metal can slow you down significantly during security. She advises avoiding shoes "with large metal adornments" or "anything studded which some TSA agents might not allow through." Even the shape of your jewelry can be an issue. Fischbach notes that "anything that looks like a potential weapon is a no-go, so use your imagination at times," using multi-finger rings as an example. "I always am sure to take off all jewelry before I get to the airport and keep it in a convenient place for after I get through security," she says. "Even gold pieces you think are safe might not be. I've had my Cartier Love bracelet set machines off, and trying to unscrew that with a nail isn't fun—especially when you are frantically trying to do so." One of the most common mistakes Fischbach sees when people are flying is failing to dress for the conditions of the plane. "Practically every flight, I see someone with barely any clothes on—crop tops with booty shorts; sports bras and leggings sans jacket; bathing suits and board shorts. You name it; chances are we've seen it," she recounts. "And practically every time we see this, these are the people who want a blanket on flights we don't provide them on. We all know airplanes are freezing, and it's just common sense to dress for it." You can always keep extra layers, or even a full outfit option, in your carry-on. "It doesn't hurt to have a change of clothes on you," suggests Fischbach. "You might be that unfortunate soul next to the one person who gets airsick or ends up with a missing bag only to be found 3000 miles away." To sum things up, Fischbach says it really comes down to this bottom line: "Cover yourself up for safety and comfort, wear covered shoes in the lavatories. And yes, it is possible to dress comfortably and still look chic." Once you've studied up on Fischbach's concise list of items to avoid while flying, sub in her flight-friendly go-tos. Layering is her top suggestion for ensuring you enjoy a comfortable flight. "I always try to layer for flights I'm on as a passenger," she explains. "If you must wear a skirt or dress, wear tights underneath, even if it's the middle of summer and you are traveling from Miami to Cancún." Fischbach says she favors cropped pants when she's flying as a passenger. "J.Crew makes a pair with an elastic waistband that are so comfy you feel like you are in your pj's but still sophisticated," she says. She also brings her own thick socks for extra warmth for her feet. "I usually bring a lightweight jacket or cashmere hoodie with lots of lightweight layers underneath," explains Fischbach. "I am always cold, so I need lots, but there are those occasions where the aircraft is blazing hot and even I need to cool off." One of her flying staples that offers versatility and an easy way to adapt to the temperature is a big cashmere scarf. "I never travel without that," she says. "A lightweight one for summer and thick one for winter," which is also great if blankets aren't provided on the flight. "It is possible to be comfortable without looking like you just came back from the gym or rolled out of bed." For those who want to dress up for a flight because you're traveling for business or seated in first class, Fischbach reassures that "dressing up and remaining comfortable isn't as difficult as it sounds." She suggests the outfit formula of a blouse with a sweater and cropped pants as an easy go-to for traveling for business. 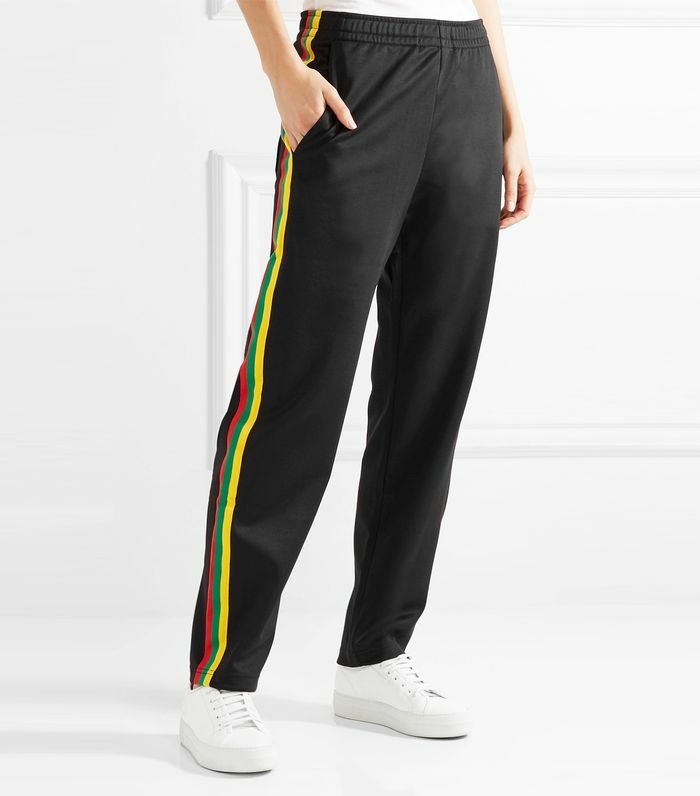 "I've seen more and more companies incorporating elastic into the waistbands of many of their slacks," naming Uniqlo as one such brand, "and a flowy blouse can easily hide any evidence of a not-so-fitted waistband." Choosing the right material can also increase your level of comfort." Lots of dressier pants have a bit of stretch to them now, always a more comfortable choice in any situation," Fischbach notes. She also suggests sheath dresses which work with tights or nylons. "Don't forget blazers to dress it up if you're on your way to a post-flight meeting and maybe a change of heels if flats or loafers don't work for your total ensemble," she says. "And ask your flight attendant if it is okay to hang it in the closet. Who wants added wrinkles? Look your best!" Traveling soon? Learn the worst things to wear to the airport, according to a TSA agent. This story was originally published on August 25, 2017 and has since been updated.